I've had a Strathmore Coal Black Drawing Pad in my stash for a while now and using it is a really different experience than drawing with dark mark-making tools (pen, graphite, charcoal) on white paper. Recently I tried my hand at tangling with white gel pen and white pastel pencil on this black paper as a way to overcome artist block and it worked. But one drawing only gets me so far. That's just the first pancake. You know, the tester pancake that gets a little overdone on one side but is still gooey in the middle as you fine-tune the temperature of the griddle and the thickness of the batter. That first pancake is usually edible but it's far from the fluffy, golden brown flapjack you were envisioning. If my goal is learning more, making better and more meaningful art, I can't stop there. I need to keep making more pancakes. One way to dig deeper is to do some (kind! compassionate!) self-critique to assess how well I've been handling the elements of art and the principles of design. For this post I'll stick to the elements of art which are the visual building blocks used by an artist: line, shape, color, value, form, texture, space. 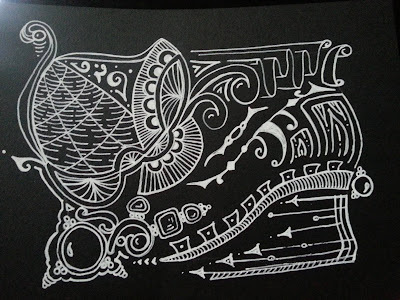 Up until recently, my approach to tangling on black paper relied heavily on the art elements of line, shape, value, and texture (through pattern). and the meditative application of repeated line, shape, and pattern. Drawings like this one can be fun to create and interesting to look at because of the varied and complex patterns arranged in whimsical ways. 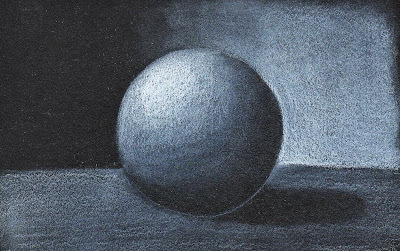 I notice though, that it is missing the representation of dimension (form) and depth (space) that I've been learning to add with graphite shading to my drawings that start with a light background. Artist and instructor Eni Oken calls it "shading fearlessly" and her instructional materials and mentorship has influenced a huge improvement in my work. 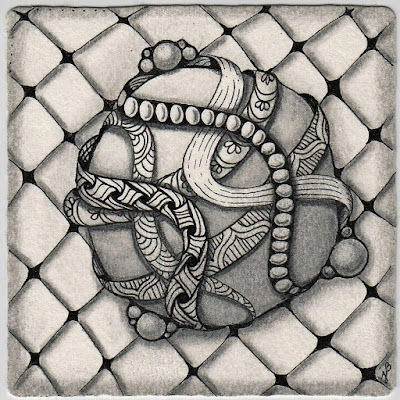 Unlike Zentangle, which relies heavily on outlines, classical drawing techniques use changes in value and negative space to indicate the edges of an object and to render the illusion of a 3D form, like this sphere. dimensional form with bright light and dark shadows. 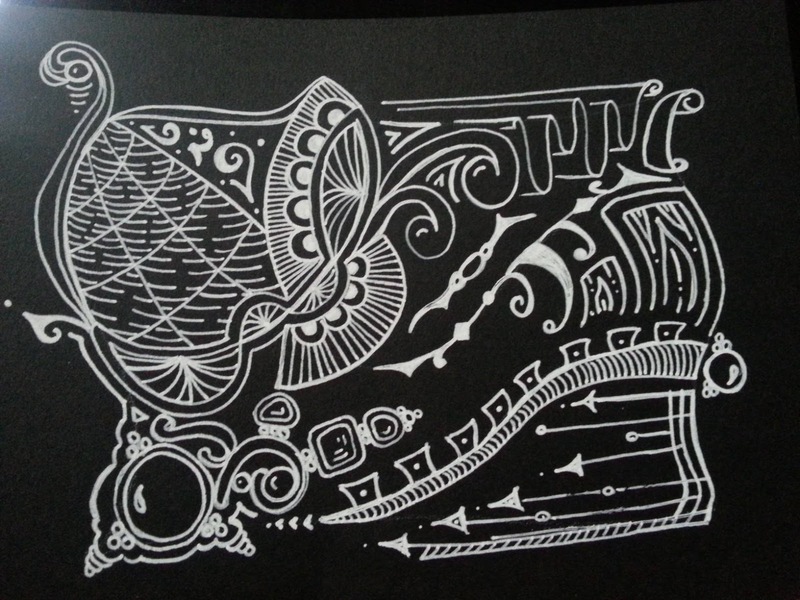 So my challenge for myself over the next few weeks is to figure out how I can marry the two approaches together to create lively, three-dimensional drawings in the Zentangle style on dark paper. What are you going to challenge yourself to do art-wise this week? My advice to myself, and to you, is to try something new and then try it again and again.